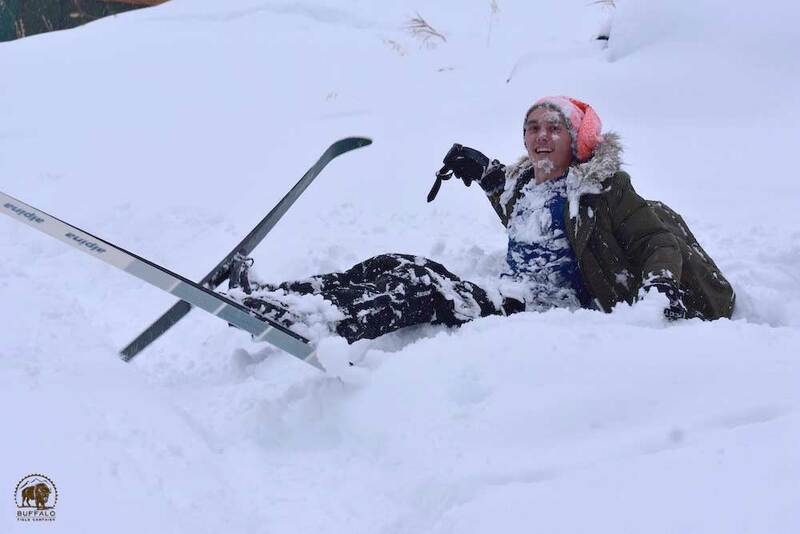 After a well done ski down a steep mountain side, Gage takes a faceplate in the snow. Photo by Stephany Seay, Buffalo Field Campaign. When first arriving to Buffalo Field Campaign you are greeted by a group of friendly coordinators and volunteers that say hello while everyone helps unpack the new volunteer’s luggage and the week’s groceries. 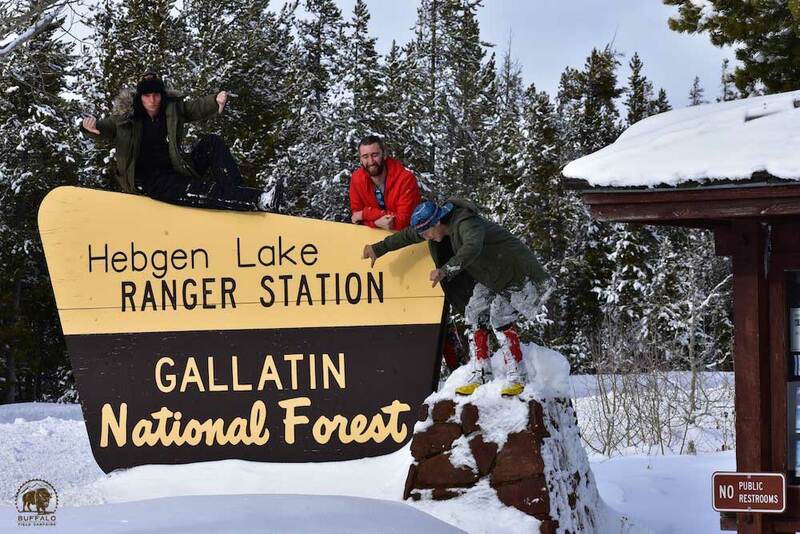 The coordinators gave a short tour of the main cabin and discussed the surrounding area of base camp before the new volunteers begin to settle in and formally meet the other volunteers. On my experience, I was greeted by volunteer coordinator Toe and he shared with us the different sleeping arrangements within the main cabin. There is a room disconnected from the commons by a hallway nicknamed the post-office, which was the room I chose to stay in, but the other options consisted of the map room, and Siberia. All the rooms contained lofts that reminds you of forts you would build out of cushions and blankets, but were suitable for a proper night’s rest, which is needed when actively participating in the day to day responsibilities. The kitchen is connected to the commons and communal meals are served that offer a variety of healthy options that cater to anyone’s dietary needs. The bathrooms are well-kept and are accompanied with a clean washer and dryer. Behind the main cabin is the media cabin and the radio cabin. The media cabin is primarily where coordinators can go to focus on camp projects and interactions. The radio cabin is used for keeping in contact with the daily patrols and taking calls. There is internet connection within all these cabins but BFC supports genuine human interactions and follows a no technology rule within the commons area in the main cabin. Anywhere else if free game though, we regularly watched movies within the radio cabin or post office after dinner if we weren’t talking or playing games. 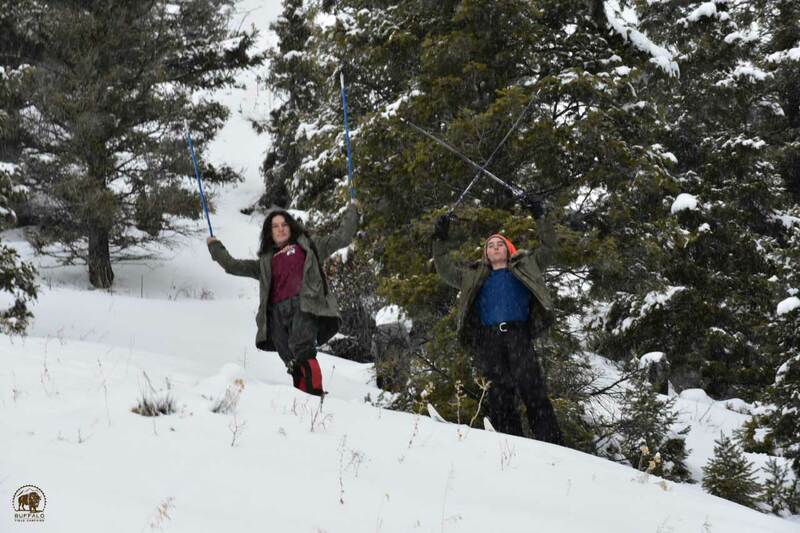 BFC volunteer coordinator, Jaedin Medicine Elk, takes Gage up the mountain in the back yard for some ski experience. Photo by Stephany Seay, Buffalo Field Campaign. On your first day, you will meet more of the camp coordinators and they will go through a deeper introduction to the camp and inform you on the current issues regarding the buffalo and the actions of Buffalo Field Campaign. Coming from Northern Ohio, I was not currently aware of the devastation that continues to happen to our nation’s wild buffalo. The herds located in Yellowstone National Park are descendants of North Americas last genetically wild migrating buffalo. These animals represent our own nation and have purpose in life far deeper than any current mainstream understanding. 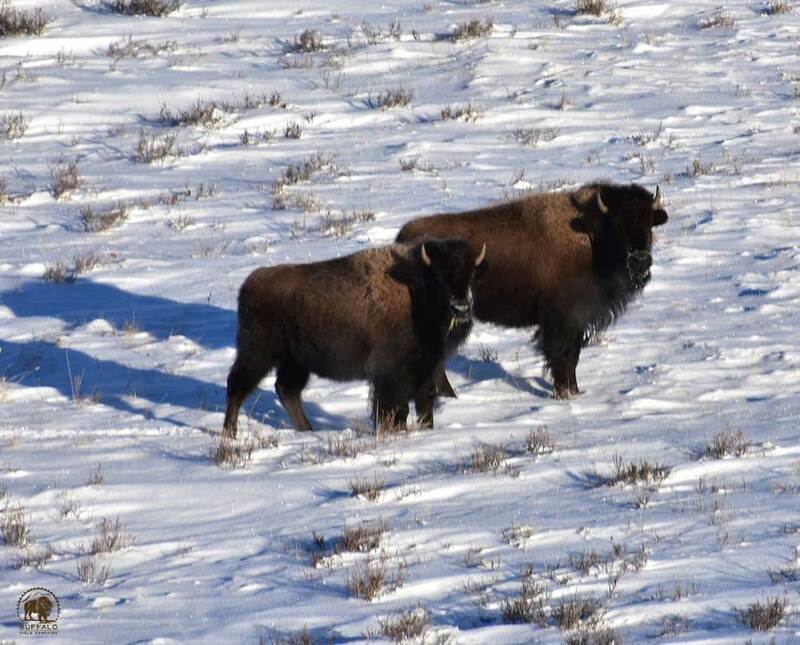 Currently the Interagency Bison Management Plan (IBMP), promotes the slaughter and harmful quarantine of the wild buffalo. The actions decided between Yellowstone National Park and the Montana Department of Livestock under IBMP have endangered the wild populations. The migrating herds have also been forced to deal with hunting and hazing which consists of hunters waiting along designated borders of Yellowstone National Park as the gentle buffalo migrate into hunting zones and then shoot entire family groups. If the buffalo migrate into areas that are not buffalo safe zones they can be chased or “hazed” with snowmobiles, helicopters, trucks, horses, and gunshots. Some residents of Montana have described the remnants of a hunt to be compared to a mass murder scene with carcasses and gut piles spread along the normally scenic rainbowpoint road which is a common patrol route within Buffalo Field Campaign’s daily routine. The Montana law MCA 81-2-120 allows the Montana Department of Livestock to manage wild buffalo as “an animal in need of disease control” even though they are wildlife who have never spread the livestock disease brucellosis to cattle. The buffalo should be respected as wildlife, such as the way Montana’s elk are treated. Due to the Department of Livestock’s control on the buffalo’s migration, the herds full potential for evolutionary potential has been stolen from them. Yellowstone National Park's participation is in baiting wild buffalo into fenced areas, then after being captured, the buffalo are transported to slaughter facilities, or quarantined in ways that regularly injure and maim, or eventually domesticate, the wild buffalo. By using false information and a deep rooted idea that buffalo endanger ranchers livestock, the cattle industry still holds a strong grip on bison management and continue to manipulate their actions in favor of the cattle. On the Gardiner Basin field trip we got to head into Yellowstone National Park and check in with the buffalo hanging out in the Blacktail Plateau. Photo by Stephany Seay, Buffalo Field Campaign. 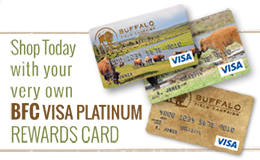 Buffalo Field Campaign is dedicated to protecting the last wild bison in the field by daily patrols of the Yellowstone National Park borders and surrounding area near basecamp. These patrols are mainly what I experienced first-hand within the field as a first-time volunteer. After you are updated on the current issues, you will go on a patrol the following day. Members of camp refer to it as “Rookie Rove”. You accompany an experienced group leader that educates you on the common areas visited on patrols. If you don’t feel up to going outdoors somedays, there are plenty of opportunities to help around base camp. All the daily duties are distributed among the volunteers and coordinators during the nightly meeting. The Facilitator leads the meetings and people voluntary choose between different jobs such as AM/PM patrol, AM/PM radio shifts, AM/PM clean up, and other communal living/activism related responsibilities. The coordinators work together to maintain a positive atmosphere among the volunteers and encourages a healthy lifestyle with active participation. Throughout my three-week trip, I learned many things I never would have experienced in Ohio. Due to a slow winter, the buffalos' migration was happening later in the season than usual. This means that during my trip they remained safe within Yellowstone National Park borders but patrols around West Yellowstone were rather slow. With not much movement on the West side, some coordinators took us to Gardiner, Montana where the buffalo face the most danger when they migrate through the north entrance of the Park. BFC has a Gardiner camp where volunteers and coordinators can stay and be present during the northern boundary migration. This is where a lot of bison herds are hunted, hazed, and captured for slaughter or quarantine. The coordinators took us through Yellowstone National Park’s north entrance, into the Blacktail Plateau, so we could locate the herds. While we love our national forest lands we don’t care so much for the things the Forest Service allows to happen to the buffalo on these lands. Photo by Stephany Seay, Buffalo Field Campaign. During my stay, we also acted on the legislative side of protecting the bison. We attended a public lands speech given by Montana’s Governor Steve Bullock. We made banners and signs to rally for the bison at the state capitol building in Helena, Montana. Getting to see all the activists for public land was inspiring. The building was flooding with hundreds of people there to protect their lands from privatized investors such as mining, oil, and agriculture companies. Driving through Montana is an experience within itself, realizing how open and far the land and sky stretch across the mountains surrounding you as you drive. Constant views that make you readjust to get a better view out of the car window as the valleys or “coulees” pass you by. During my stay, I met with people from many different backgrounds. I am happy to call all the members of BFC my friends and I feel as if I have become part of a family. A family that stands for something greater than BFC itself. A family and stands for each other, the buffalo, natural human rights, and a strong understanding of what is morally good. I definitely plan to return to Buffalo Field Campaign within the near future to help support this great community and the buffalo.